Backed by sound amenities and a talented team of personnel, we have evolved as the leading company offering a superior quality plethora of Wooden Packaging Boxes to our customers. Making use of optimum class basic material and advanced tools and machinery, the entire collection is developed as per the latest market trends. Used widely in packaging purposes, these products are highly demanded. We "Hardik Industries" are a leading and well known organization engaged in manufacturing and supplying qualitative assortment of Packaging Wooden Boxes, Wooden Pallets, Storage Wooden Boxes and Wooden Platform. 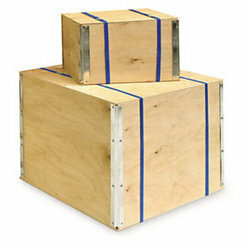 Apt for packaging purposes, these products are widely demanded in numerous industries. The packaging products are manufactured by our highly skilled team members using premium quality wood and the latest machinery. The offered packaging products are widely demanded across the globe for their features such as precise deign, high strength, reliable usage, termite resistance, capacious and durability. To meet the diverse choices of the customers, we offer these packaging products in several specifications. Quality of offered packaging products is properly checked by our quality experts in order to provide flawless and qualitative products to the clients. Our clients can avail these packaging products from us in large quantity at reasonable rates. Plot No. 1911, Phase-2, G.I.D.C.